Remember the Big Bucket of Monsters and Big Bucket of Zombies figure tubes released by SCS Direct a couple years ago? It took a while, but the company has finally put out a couple of new figure tubes -- this time Fantasy Creatures and Robots! 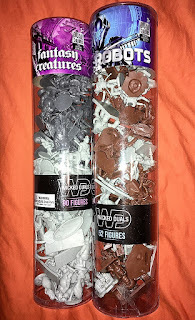 The figures are packaged in clear tubes that measure about 16 inches tall, featuring the moniker "Wicked Duals" and different artwork for each set. The fantasy set says "dual colors for fantastic adventures" and the robot set says "dual colors for deadly catastrophic battles." Gotta love some deadly catastrophic robot battles! Now let's take a closer look at each of the sets. This set consists of a dragon, a unicorn, a skeleton warrior, a wizard, a dwarf, a centaur, a female elf warrior, a fairy/pixie, and what appear to be two different versions of either an ogre, troll, or orc -- one-headed and two-headed. Overall, it's a nice selection of characters, and the sculpts are good. My favorite is the two-headed brute, because of the quality of the sculpt itself and the fact that I don't believe we've gotten a two-headed ogre in similar fantasy sets before (someone correct me if I'm wrong). Also, I appreciate that the skeleton warrior's sculpt was differentiated from the several other skeleton warrior minis that have been released in recent years. On the negative side, I was disappointed that SCS went with bland light and dark gray colors again. 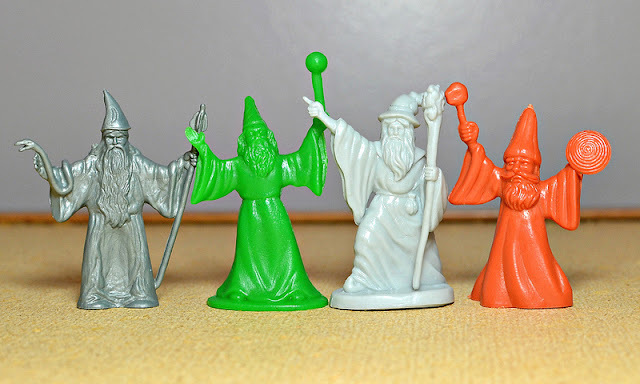 They might be good for people who paint their minis, but I'd imagine most monochromatic mini figure collectors would find these colors pretty boring (like I do). Because of the softer plastic used, several of the figures in my tube came bent and misshapen (particularly the skeletons, because of their thin limbs). 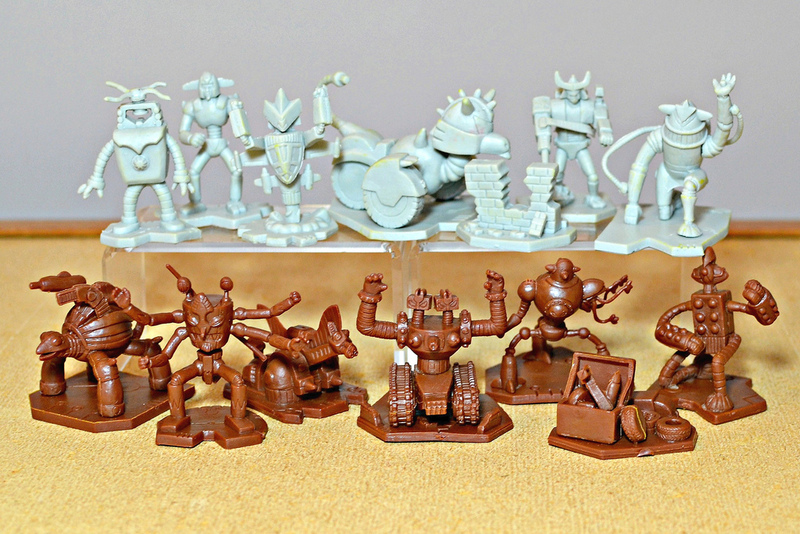 Also, some of the figures are made up of more than one piece, which resulted in some quality control issues. For example, one of my fairies is completely missing her arms from a factory error, since they are separate pieces attached to her body. I'm really impressed with the Robots. A lot of creativity went into these designs, which were created by artist Frankie B Washington. Instead of just going with the usual humanoid robots, there's a bunch of pretty bizarre ones here. There's a few that look to be inspired by Japanese/anime bots, but the rest seem to take inspiration from old sci-fi B movies and artwork, which is awesome. I also like the size variation used with this set -- it makes for more interesting robot battles! 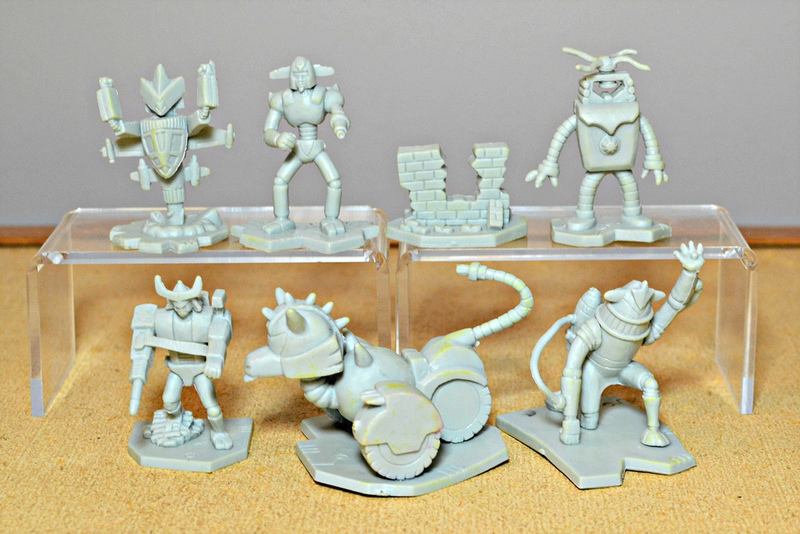 I should also mention that only 12 sculpts are actually robots -- 2 are more like scene building pieces. Instead of light gray and dark gray, this set comes in light gray and brown. On paper, brown may not seem like the most interesting color either, but it's a nice chocolate brown shade that works really well with these sculpts. 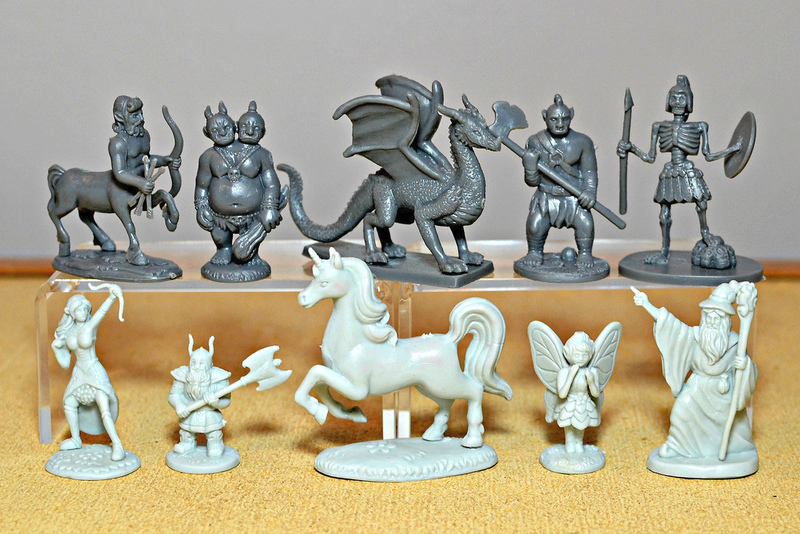 The light gray works a little better here than it does with the fantasy creatures, but it's still on the dull side. Plus, several of my gray robots came with spots of discoloration -- I'm not sure if this happened from them being in contact with the brown figures, or some other factor. Unfortunately, the Robots also have the same other quality control issues as the Fantasy Creatures -- occasional unattached pieces and misshapen figures. Most of the figures are fine, but it was a bit of a bummer to see any of them at all have these faults. Despite their imperfections, I'm really glad to have both of these sets. The Robots in particular have some really unique designs to add to any mini figure collection. 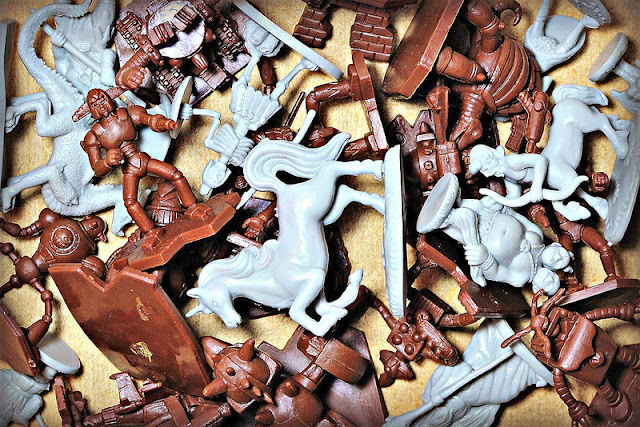 And each set gives you a whole bucket full of figures for $15, which makes any issues easier to overlook. Now we just need an aliens set! What about you? Do you plan to pick up the Fantasy Creatures and Robots sets? The robots look great. This past Halloween I offered the kids a choice of candy or monsters from Big Bucket of Monsters. Some kids went nuts over the monsters, others rolled their eyes and grabbed candy. Fun! I wish someone would have given me monster figures when I trick or treated as a kid. 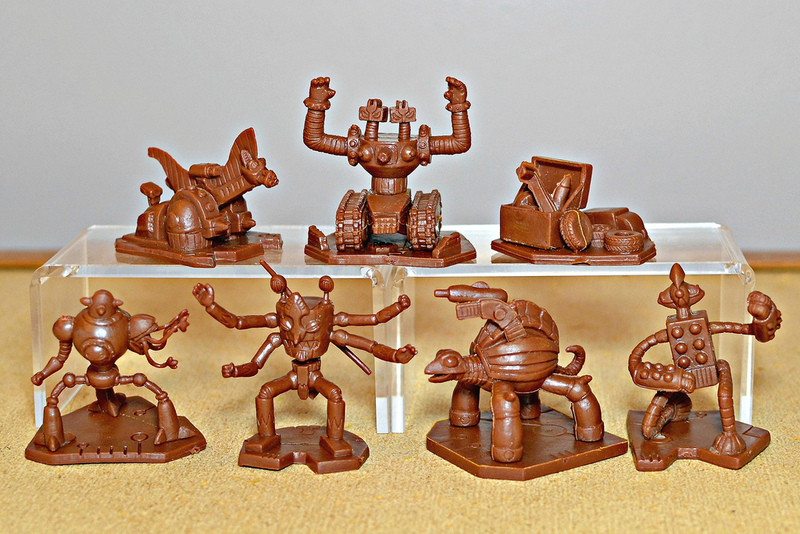 I say The Robots are wonderfully sculpted! I agree. I asked the company for the name(s) of the sculpturers when i was passing my art in but I never got. I really wanted to Thank them for a fantastic job working off of my art. One of the Robots has Judge Dredd's helmet on? That's either too cool for Police Collage or a sign that Dredd finally took 'the long walk' . . . and lost to a robot! Which one is wearing the Judge helmet? Thanks so much for the review. I'm so happy that everyone dug the ROBOTS. When I was commissioned by SCS Direct Inc. way back in 2015 to develop and illustrate these figures for this line. I was beside myself with joy. I had just done a ton of illustrations for a kaiju-related card game from Sunstone Games... And now this. I will say that i'm more partial to the grey colored figures. I like that unfinished look and opens up the future possibility to color them myself. I hope that this set does well and I get another swing at developing/drawing more ROBOTS or hopefully KAIJUS!!! Great to hear from the artist who designed them! They are very, very cool designs. I will add your name to the post. I hope there will be additional releases as well. Kaiju would be excellent.